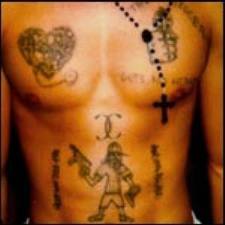 Tattoos are used among criminals to show gang membership and record the wearer's personal history such as his or her skills, specialties, accomplishments and convictions. 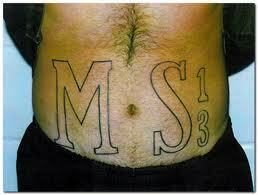 They are also used as a means of personal expression. 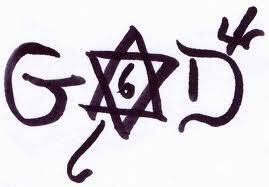 Certain designs have developed recognized coded meanings. 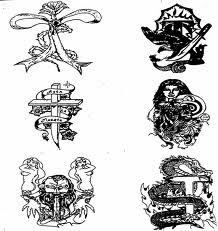 The code systems can be quite complex and because of the nature of what they encode, the tattoos are not widely recognized. 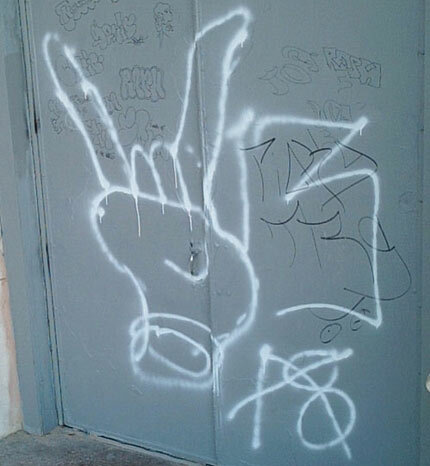 Graffiti has long been seen as a gang-related activity, and its use is closely connected to the fact that many gangs have particular areas that they always try to control. 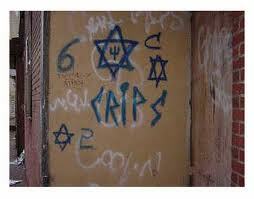 As above, the graffiti is often highly symbolic and may contain more information about the gang's activities, values, and their current enemies. 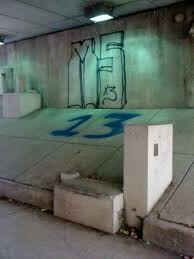 Most often, gangs spray graffiti to mark territory or send a threat to a rival gang. 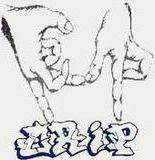 When at war with another gang, they may visit locations the rival gang has already made their mark upon, crossing out the names of enemies they have killed, or simply covering up the rival. 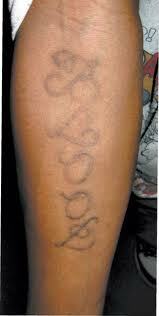 This is also known as a "cross out". 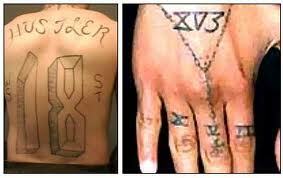 A gang sign with the hands is one of the most known and obvious forms of "claiming." 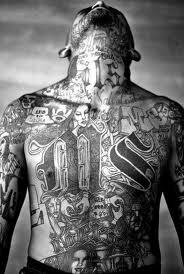 It is used in many situations where other identifiers may not be possible or appropriate, and it can also show that a gang member is in the area to "do business" as opposed to just passing through. 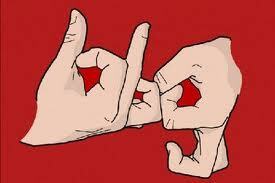 Usually these signs are made by formation of the fingers on one or both hands to make some sort of symbol or letter. 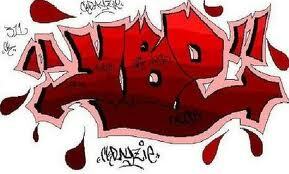 It can also serve to relay more specific information, such as what set they represent within a larger gang or in which activities they are currently taking part. 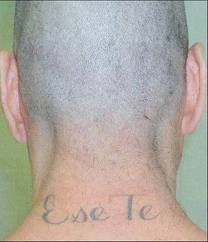 Individual letters can be used to tell stories when flashed in rapid succession, each representing a word beginning with that letter. These signs, because they are displayed only when wanted (as opposed to the types of identifiers above), are usually the most consistent across various areas. 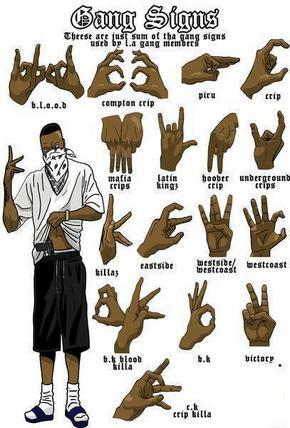 Many of these hand signals are quite close to other common hand signs, and this can cause confusion among gang members, non-gang members, and anti-gang authorities. 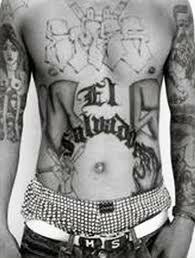 Many Mara Salvatrucha members cover themselves in tattoos. 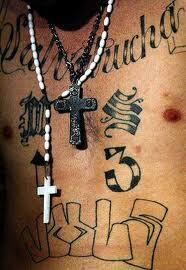 Common markings include "MS", "Salvatrucha", the "Devil Horns", the name of their clique, and other symbols. 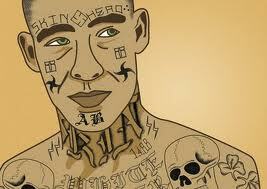 A December 2007 CNN internet news article stated that the gang was moving away from the tattoos in an attempt to commit crimes without being noticed. 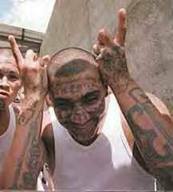 Members of Mara Salvatrucha, like members of most modern American gangs, utilize a system of hand signs for purposes of identification and communication. 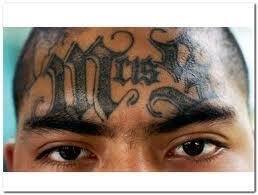 One of the most commonly displayed is the "devil's head" which forms an 'M' when displayed upside down. 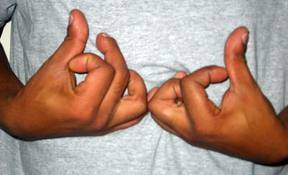 This hand sign is similar to the same symbol commonly seen displayed by heavy metal musicians and their fans. 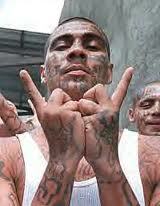 Founders of Mara Salvatrucha borrowed the hand sign after attending concerts of heavy metal bands. 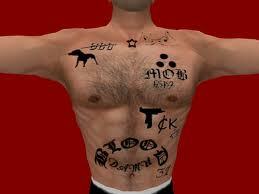 Bloods members identify themselves through various gang indicators such as colors, clothing, symbols, tattoos, jewelry, graffiti, language, and hand signs. 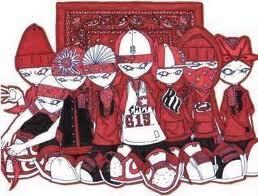 The Bloods gang color is red. 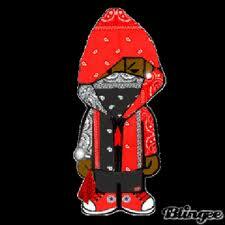 They like to wear sports clothing, including team jackets that show their gang color. 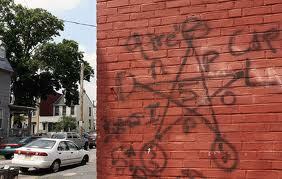 Some of their favorite teams include the San Francisco 49ers the Philadelphia Phillies, and the Chicago Bulls. 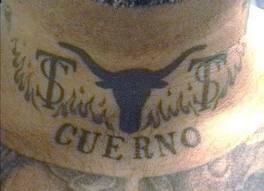 They are also known to wear Dallas Cowboys clothing, whose logo contains a five-pointed star. 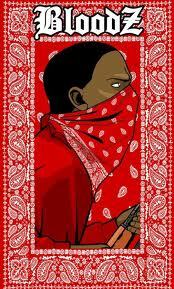 The most commonly used Bloods symbols include the number “5,” the five pointed star, and the five pointed crown. 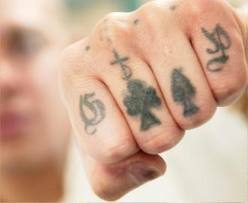 These symbols are meant to show the Bloods’ affiliation with the People Nation, a large coalition of affiliates created to protect alliance members within the federal and state prison systems. 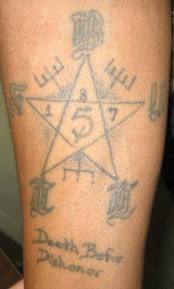 These symbols may be seen in the tattoos, jewelry, and clothing that gang members wear as well as in gang graffiti, which is used by the Bloods to mark their territory. 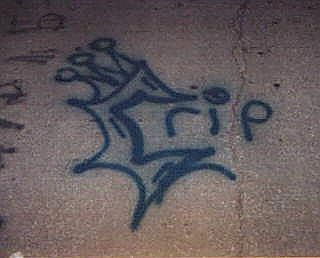 Such graffiti can include gang names, nicknames, declaration of loyalty, threats against rival gangs, or a description of criminal acts in which the gang has been involved. 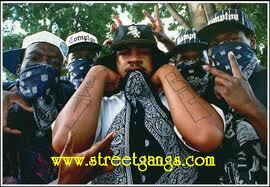 The Bloods gang was formed by individuals from Piru street in Compton, California. 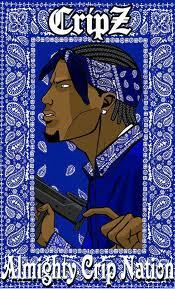 The Crips are a primarily, but not exclusively, African American gang. 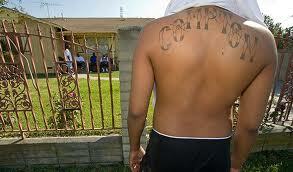 They were founded in Los Angeles, California, in 1969 mainly byRaymond Washington and Stanley Williams. 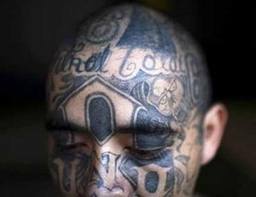 What was once a single alliance between two autonomous gangs is now a loosely connected network of individual sets, often engaged in open warfare with one another. 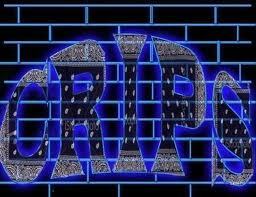 The Crips are one of the largest and most violent associations of street gangs in the United States, with an estimated 30,000 to 35,000 members. 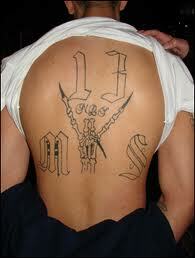 The gang is known to be involved in murders, robberies, and drug dealing, among many other criminal pursuits. 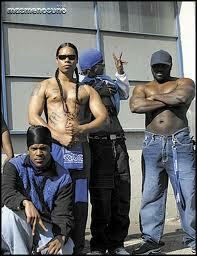 The gang is known for its gang members' use of the color blue in their clothing. 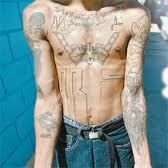 However, this practice has waned due to police crackdowns on gang members. 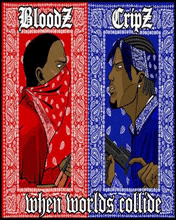 Crips are publicly known to have an intense and bitter rivalry with the Bloods and lesser feuds with some Chicano gangs. 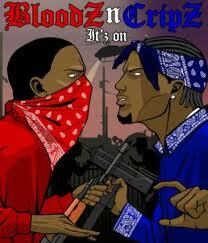 Crips have been documented in the U.S. military, found in bases in the United States and abroad. 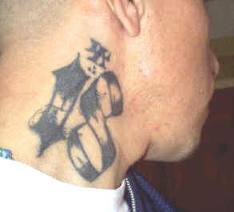 The Texas Syndicate (or Syndicato Tejano) is a mostly Texas-based prison gang that includes Hispanic and at one time, Whitemembers. 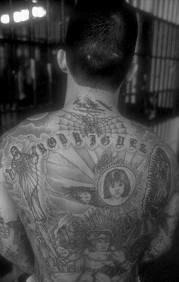 It was established in the 1960s at Folsom Prison in California in direct response to the other California prison gangs (notably the Aryan Brotherhood and Mexican Mafia), which were attempting to prey on native Texas inmates. 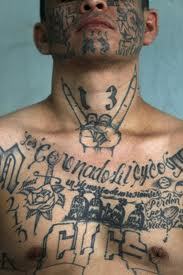 Los Zetas cartel has been known to hire US gangs such as the Texas Syndicate and MS-13 to carry out contract killings. 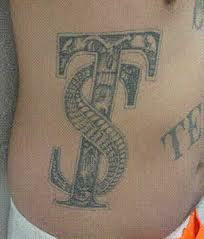 Texas Syndicate Tattoos and Symbols - A heart for an executioner used for ex military recruits. A trident for an enforcer used for ex military recruits. 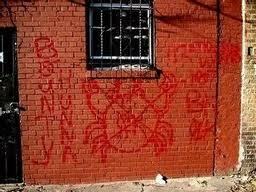 Three marks of a bird's footprint for a drug dealer. 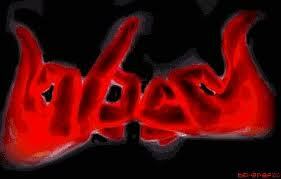 Five marks of a bird's footprint for a weapons supplier. 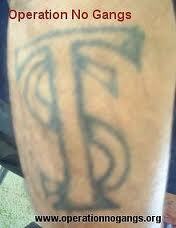 Tattoo of an overlapping "TS", or an "S" superimposed over a "T".